On Wednesday, Michelle Wolf appeared on NBC’s Late Night with Seth Meyers, where she used to work as a writer, to promote her new Netflix series. Wolf claimed that Sarah Sanders called her to say she enjoyed the comedienne’s performance at the White House Correspondents’ Dinner last month. ‘Actually, Sarah Huckabee Sanders called me. And she was like, “I loved it so much. I got every joke,” Wolf claimed. However, the White House says otherwise. The White House told the Daily Caller Thursday that Sanders never called Wolf. 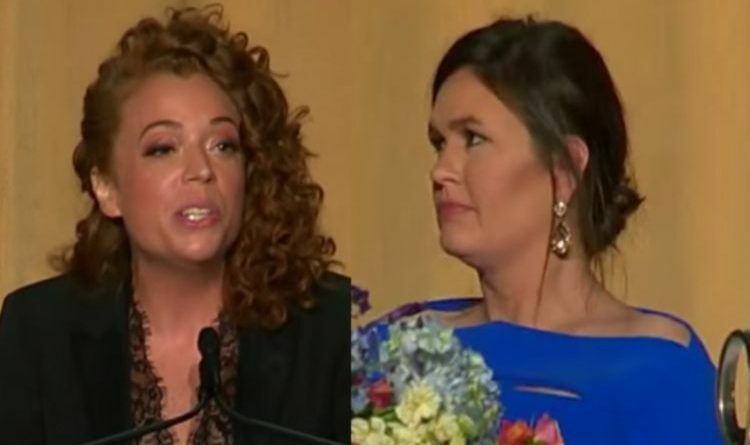 Last Thursday, Press secretary Sarah Sanders responded to comedian Michelle Wolf’s personal attacks at the White House Correspondents’ Dinner. The truth is everyone has forgotten about Michelle Wolf. Her 10 minutes of fame is almost up. Now she is appearing on the Seth Myers show, which NO ONE watches and tries to stay in the limelight. Without LIES (even with them) the Marxist ‘left’ has nothing worth discussing. They just can’t help themselves. Doubling down on their crude, tasteless insults, disguised as “humor” but directed to their classless, morally bankrupt audience of leftists as the insults they’re meant to be. Their true colors, as always, shining through the muck. ← Trump’s ICE Deported Major Illegal Immigrant Activist Who Had It Coming – NOBODY Is Above The Law! BOYCOTT! SARAH SANDERS WAS THROWN OUT OF VIRGINIA RESTAURANT BECAUSE SHE WORKS FOR TRUMP – HERE ARE THEIR YELP AND FACEBOOK PAGES JOIN THE BOYCOTT!